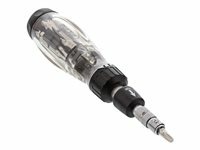 The driveless Flex screwdriver with bit holder from InLine is the ideal companion for the household, on the construction site or for hard-to-reach places, where a screw has to be tightened, loosened or re-screwed. The included 12 changing bits and the extensible spring extension make the hand screwdriver an indispensable item of everyday life. Have the right screwdriver at hand in fast and easy way.